Global Road Entertainment releases Hotel Artemis nationwide on June 8th, 2018. Drew Pearce: I actually didn't go into Hotel Artemis with either darkness or lightness in mind. I think that the element of living in 2028 has a certain darkness to it, for sure. Also, the contrast of a movie that's almost always populated by criminals has a darkness. One of my favorite this is varying tone and story. I wanted to make sure that there was both light and shade in the picture. That said, it's very hard to get drama, tension, fear or sadness unless there's an element of darkness to it. NYC MOVIE GURU: When it comes to finding the right balance between entertaining the audience, provoking them emotionally as well as intellectually, which of those three elements were most challenging to tweak in the editing room? DP: Honestly, I think that that's the most ephemeral, but important part in the editing process. You have to move between all of those things whether it's an actor's performance or inside one scene, it has tobalance the whole movie. It's the reason why you end up losing the parts of a movie that you love so much sometimes. They may work brilliantly in the scene or even in the act or reel, but when you see the entire film, maybe it slows it down or makes you simpathize too much with a character. So every day, it's a juggle between those elements. NYC MOVIE GURU: I noticed that the title card in Hotel Artemis was a throwback to the 1970s while the nurse's rapid-fire dialogue was remeniscent of the dialogue found in screwball comedies during the Golden Age of American Cinema. How accurate are those observations? DP: You're absolutely on the nose. One of the things that I was going for was a mixture of emotional influences through time. It's partly because it's an LA movie. In Los Angeles, you can see 100 or 120 years of culture in front of you at any given moment. I liked the idea itself: the 1920's meets the 2020's and everything in between---the crime fictions of LA through the years, the movies of LA through the years. Texturally, with the title card, I loved the sense of how absoluteness that 70's title cards have---they literally say "This is a story." When it comes to the dialogue, one of the ways that Jodi [Foster] and I spoke about how she got inside the dialogue and made it her own was the Golden Era of Hollywood with rat-a-tat Barbara Stanwyck or Billy Wilder dialogue. That's how she unlocks it. NYC MOVIE GURU: How much do you want audiences to know about the plot of Hotel Artemis before they watch it? DP: In an ideal world, you would have audiences going in knowing nothing. That's what's nice about people who occasionally don't get to see previews. It isn't a realistic way of selling the movie, though. You have to give people a reason to go see it. Nowadays, just loving the star of the movie isn't enough. Although I'm ruined that that time has passed, one has to be realistic about it. I'd love people to go in excited about what they think the rough premise is, but with the least idea of where the story goes and what the twists or reveals are. NYC MOVIE GURU: As a screenwriter, how have you mastered the skill of incorporating exposition? DP: When it comes to exposition, I had to write this as an indie movie---on purpose---because I'm a screenwriter of many different films, some of which were really big studio movies, and there's definitely a culture within those films of a high level of exposition so that every single person in the audience is on the same page and on the same page with the movie. By the way, there's a reason for that because if you don't understand what's going on in a situation, it's often hard for a beat to land. 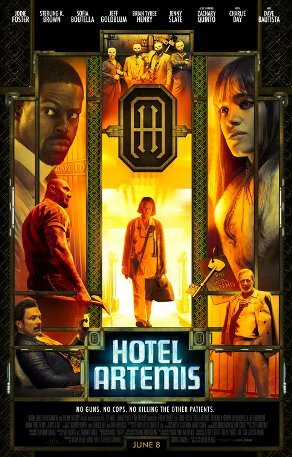 But with Hotel Artemis, I wanted to make a movie that's maybe a bit more idiosyncratic. Definitely with the movies that I've loved, whether it's Repo Man or Diva or the first Terminator or Robocop, they don't feel a need to explain everything---either on a character level---we don't need to know how someone became a psychopath---or on a universe-building level. I could let my imagination fill in the gaps. On a plot level, it's one of the most frustrating things of being a writer or director. Which is the realization that maybe following an emotional plot even if it doesn't seem to make quite as logical sense as a typical prison plot is more important than keeping the audience in the pocket of the film. Realizing that having to follow an emotional plot even if it doesn't seem to make as much logical sense as a general prison plot is audience of the film. So, sometimes you just have to let go of your more writerly inclinations which is to literally justify everything in the movie. I tried to let the characters breathe and let the audience connect with the characters and have an emotional journey and not have that be interrupted by, essentially, fact. NYC MOVIE GURU: One of the most powerful and memorable scenes in Hotel Artemis is when the nurse goes off into solitude and just cries. How challenging was it to get that scene right? If only more characters in other films, even in superhero films, could have crying scenes like that one! DP: I managed to squeeze in Pepper Potts just going off the the side and crying in Iron Man 3! I agree, maybe it would be more effective if it was happening to Tony Stark. Because I made the movie for a small budget, I didn't have to conform to as many of the expectations and norms of modern filmmaking. Definitely, the sense of shutting down a story narrative for a moment of loneliness and isolation goes against a lot of filmmaking norms. Even the concept of a thriller, which, on some level, Hotel Artemis is, is led by character. The moment in the movie that you're referring to is when where both we as an audience and the nurse let in the past for the first time. Physically and psychologically, she left the tragedy of her past in Hotel Artemis which is, in a way, a fortress of solitude that she had built. It was really important for me to keep that beat and, actually, to expand it in the editing room. I let it breathe longer and longer as the process went on because I think it's very beautiful. There's a song in that section which, between it and Jodi's performance, I felt that there was more than enough emotion to live in that moment for as long as I possibly could. NYC MOVIE GURU: What do you think are the basic elements that turn a sci-fi movie into a classic? DP: The good thing about classic sci-fi is that the term "cult classic" is almost designed for sci-fi. That's because, sometimes, you can have a more eccentric mix of influences and ideas in a film that can create something very unique. One of my favorite sci-fi novels is Alfred Brester's The Stars My Destination which is, essentually, a different novel once every three pages. What sometimes makes a sci-fi classic is something that speaks to you personally. So, maybe you can't even put a finger on what that is. Sometimes it has to do with the personality of the film. It's the fact that sci-fi is never about the time existing; it's about the time that it was written. What you take out of a movie as a feeling is much more important than what you take out of it as a plot. The journey that you go through is more important than what the stops on the way might have been. NYC MOVIE GURU: What do you think would make for a good double feature with Hotel Artemis? DP: Casablanca. Both films are about people hiding from the storm and excited about being with them. On a film fan point of view, I would say Repo Man, mostly because no one knows it.